جهت دانلود کتاب Research in Mind, Brain, and Education 1st Edition با ما مکاتبه کنبد. کتاب تحقیق در ذهن، مغز و آموزش پس از واریز هزینه ارسال میشود. ایبوک 1138946729 در آرشیو گیگاپیپر موجود است. Research in Mind, Brain, and Education cuts across and unites areas of Mind, Brain, and Education (MBE) to introduce foundational and emerging topics in the field. With chapters written by leading scholars, this book offers empirical research on specific topics including autism, math, reading, and emotion, as well as conceptual guidance on the role of models and epistemological considerations relevant to MBE. Each chapter seeks to provide a platform for exploring questions, tools, and models central to current work in MBE by emphasizing investigative focus and influences. 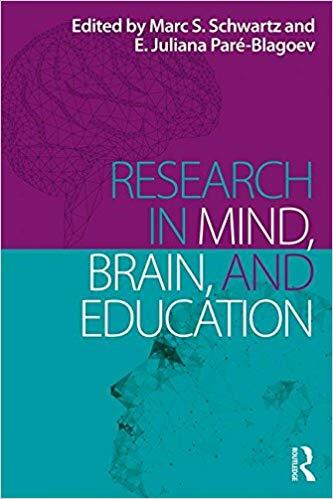 Designed both as a supplementary text for advanced undergraduate or early graduate training and as an introduction for educators, researchers, and policy makers, Research in Mind, Brain, and Education showcases the collaborative, innovative, and dynamic approach to research that is fundamental to the discipline. Marc S. Schwartz is Professor of Education and Director of the Southwest Center for Mind, Brain, and Education at the University of Texas at Arlington, USA. E. Juliana Paré-Blagoev is Clinical Assistant Professor in the School of Education at The Johns Hopkins University, USA.